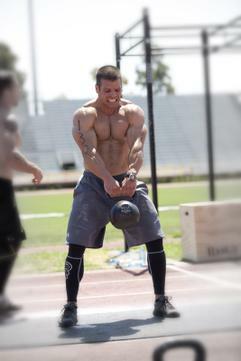 Haven't started training for the 2011 CrossFit Games yet? You might have some ground to make up. Everyone knows that Rob Orlando is strong, but this Games competitor is also extremely well rounded. His other-worldly talents were first exhibited with his completion of "One-Armed Fran." In this highlight video, Rob exhibits some of his more freakish skills that he has acquired over the years. 350-lb. deadlift is easy, right? Try it with two fingers. Power clean 185-lbs… with one hand, and tear some phone books in half while you're at it. Rob doesn't confine himself to traditional strongman training. He modifies many of the regular tools of strength and power training, and gives them a CrossFit twist. 48 inch box jumps and dumbbell push presses aren't easy by themselves. Add a weight vest and combine them into a 15 minute AMRAP workout, and you've got a nasty met-con. Also, based on the videos of the California junket, Rob seems like a darn nice guy. Best of luck in 2011! 27 November 2010 / 8:11 p.m.
Love all the profiles and videos. Any word on the dates for any upcoming Crossfit qualifiers? We are dying to know here. 28 November 2010 / 3:46 p.m.
30 November 2010 / 6:36 a.m.